Reinvigorated by a new wave of winemakers, Livermore Valley is expanding beyond the conventional wisdom of what grows best here. Yes, Cabernet Sauvignon and Chardonnay are still the King and Queen, but modern trends are infusing the winescape. White and rosé wines, and different reds of Italian, Rhône, and Spanish heritage are adding to the diversity, fueled by the fire of a new generation looking to make their mark. Here are a few of the winemakers whose vision is transforming Livermore Valley into an exciting wine region and destination. Sixth generation winemaker Steven Kent Mirassou began a quest over 20 years ago, to make Livermore Valley’s Cabernet Sauvignon the best in the world, a worthy rival to the legendary wines of Bordeaux. 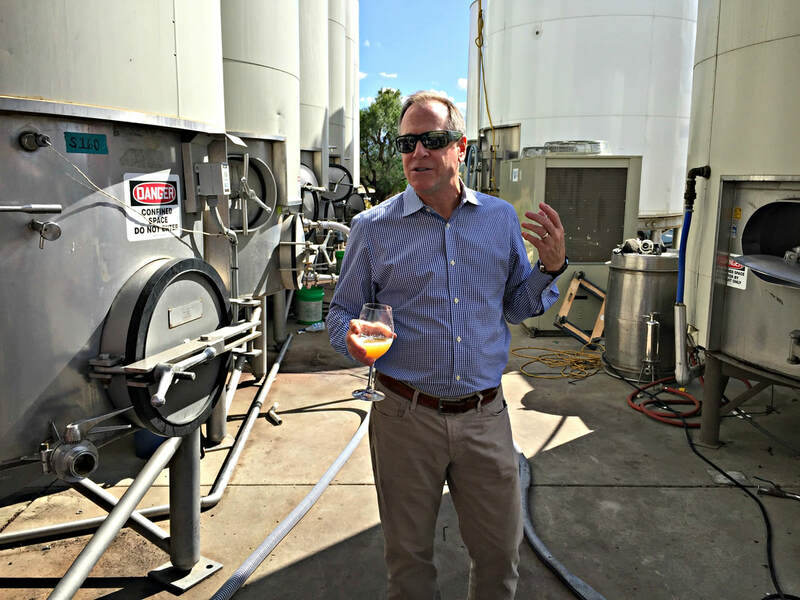 Mirassou, one of the most admired and respected vintners in the Valley, is channeling his family’s winemaking heritage through his Steven Kent Winery. He started with one wine in 1996, which today has grown to six different Cabernets from multiple clones. 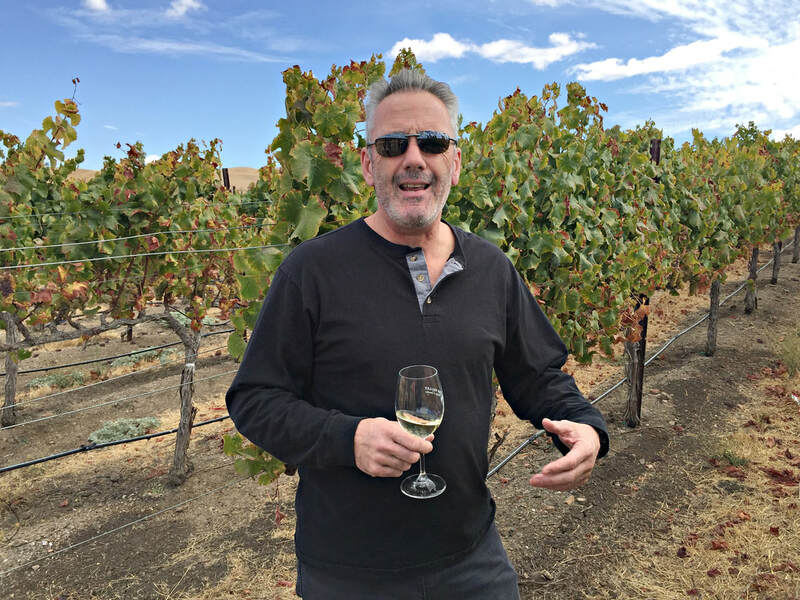 He is determined to “build more and more complexity into our wines”, looking to the very special vineyard, Ghielmetti, to fulfill Livermore Valley’s destiny. Mirassou noted, “The reason why I believe this area has the potential to grow fruit as great as any place in the world, not just Napa Valley, is this particular vineyard, it’s the Steven Kent Winery Lineage estate vineyard.” Lineage, his highly acclaimed Bordeaux-style blend, is all about the sum is greater than the parts. As Mirassou explained, “Picture this exotic beast, this beautiful, graceful, elegant beast that has Cabernet Sauvignon as a skeleton, Merlot as its flesh and muscles, Cabernet Franc as its circulatory and nervous system.” For Mirassou, it’s the Cabernet Franc that sets the pace for Lineage, the “sense of aliveness in the mouth”. Petit Verdot adds the accent, in the color, floral aromas and tannin, and Malbec provides the exotic flourish. The 2013 vintage, considered the best in the Valley in twenty years, is opulent and elegant, and will reveal so much more as it gains complexity with age. Walking the Ghielmetti Estate Vineyard, you can feel how special it is. Planted with a master plan in 2001-2002, the Ghielmetti family set aside these 64 acres to be their equivalent of France’s “premier cru" property. Six different soil types run through the rolling hills, with elevations ranging from 500-1000 feet above sea level. Situated so that each of the ten individual winegrape varietals get what they need, such as the right soils, sun and wind exposure, and proper drainage, an orderly 19 separate blocks keep tabs on the varietals and clones. It’s truly a study in terroir, a vineyard incarnate of the greatest of France. 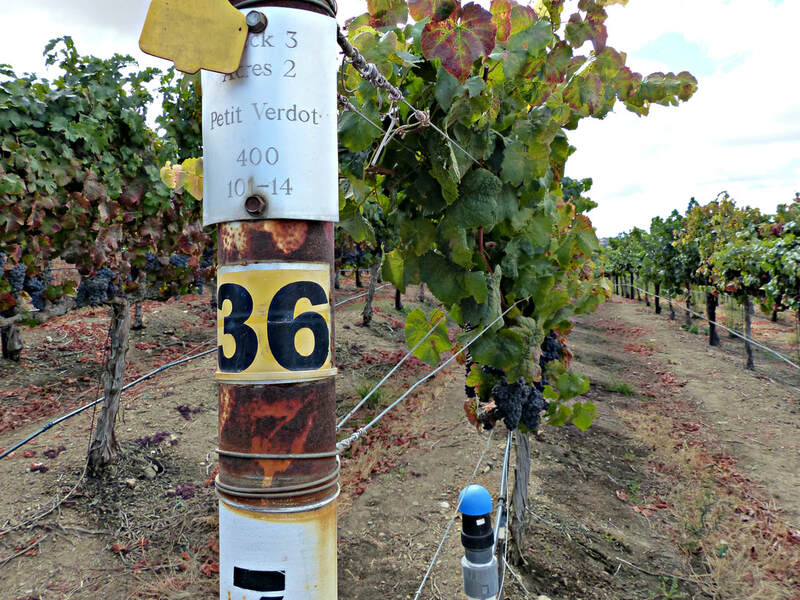 Over a decade ago, Steven Kent Winery embraced this sweet spot, and today harvests most of their fruit from here. It’s populated with all five of the classic red Bordeaux varietals, Cabernet Sauvignon, Merlot, Cabernet Franc, Petit Verdot, and Malbec, and two of the whites, Sauvignon Blanc and Semillon. The BDX Collection focuses on the red wines from here; Lola is the white Bordeaux blend. Experimenting with other options, Mirassou makes single varietal bottlings of Semillon, Chardonnay, Petite Sirah, and Barbera, in addition to two red blends. Over the years, there have been many experiments, especially with his Collector’s Circle Wines, but whichever collection, Mirassou makes impressive wines. 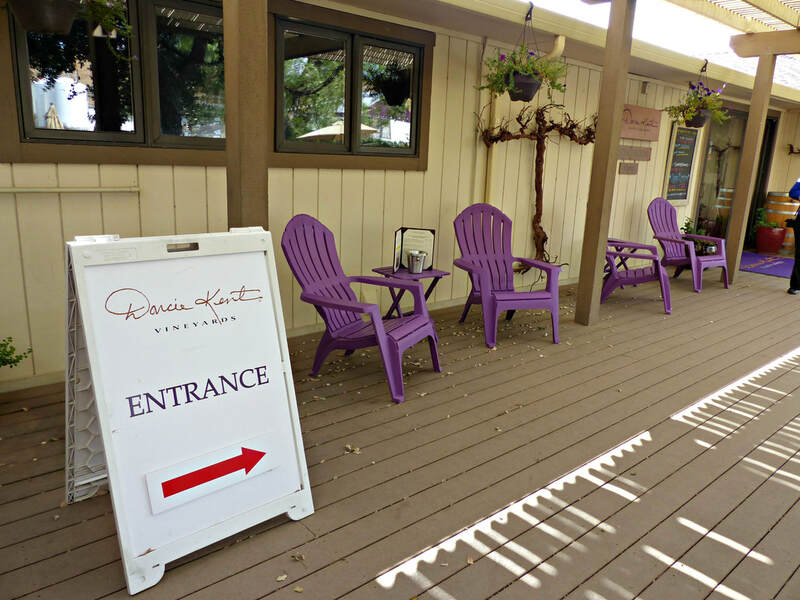 Wine tasting is available daily in the Barrel Room at Steven Kent Winery, and can be purchased through the Wine Club, or at various wine shops and restaurants. Collin Cranor is the epitomy of what’s happening in Livermore Valley today. He started Nottingham Cellars with his winemaker father, Jeff Cranor, over a decade ago, drawn by the wine renaissance that was taking place. 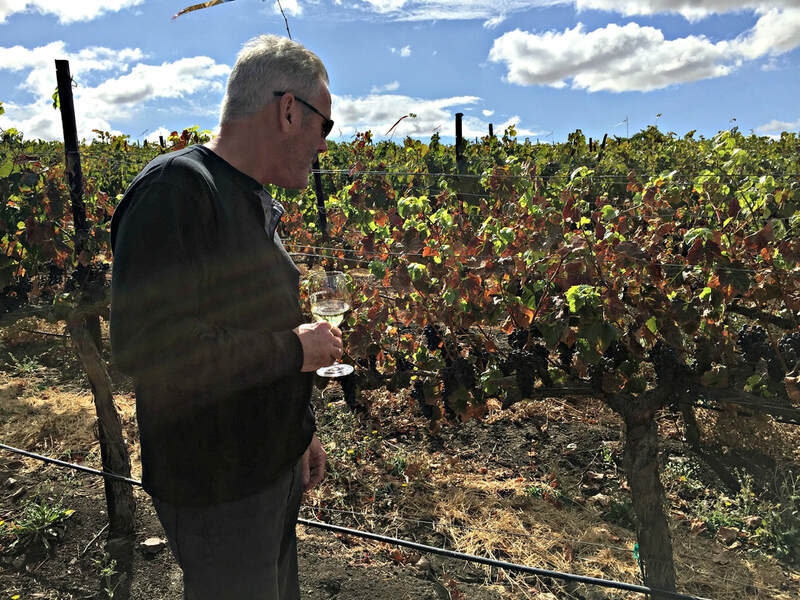 Both father and son were inspired by what they saw, according to Collin, “Steven Kent Winery was gaining momentum after 10 years into his game, Wente with the next generation, Karl, coming in, he’s been a major innovator, taking his winery to the next level. 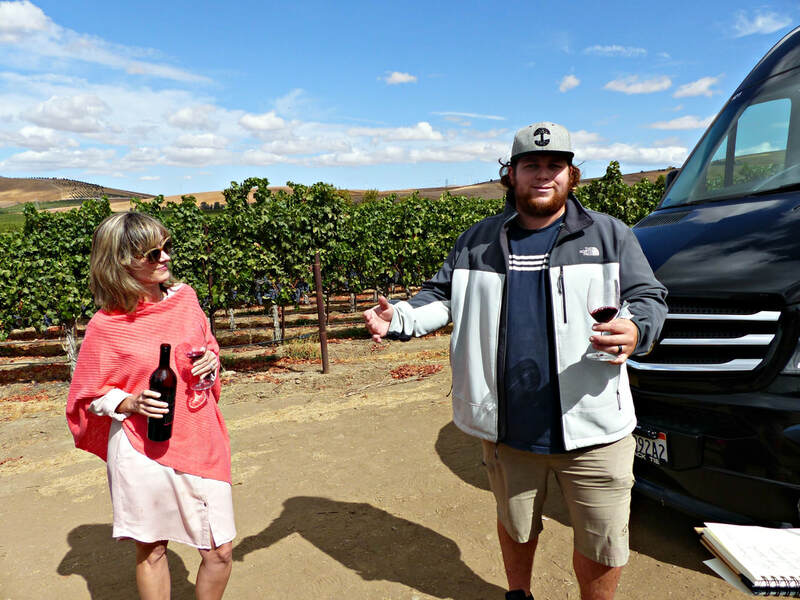 We saw this happening and saw tremendous value.” He and his dad had been sourcing Cabernet fruit from Rutherford in Napa, a very expensive situation, and recognized that Livermore Valley fruit was not only more cost effective, but the quality was there. 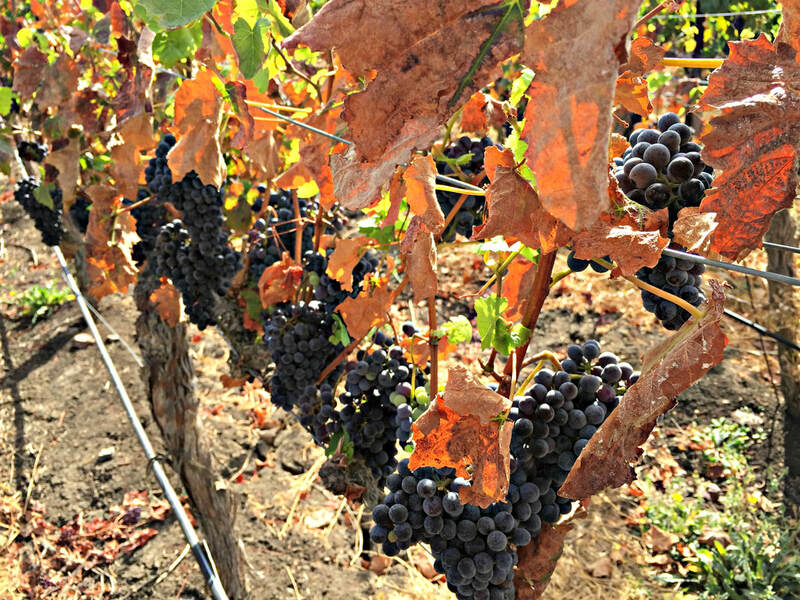 Nottingham Cellars’ wines are like a master class in Livermore Valley terroir, as each year, the Cranors dive deeper into the micro-climates and soils that make wines unique from the different corners of the Valley. Nottingham Cellars, or the N Collection, produces wines under three different labels, Nottingham Cellars, Vasco Urbano, and 1846 by Nottingham Cellars. 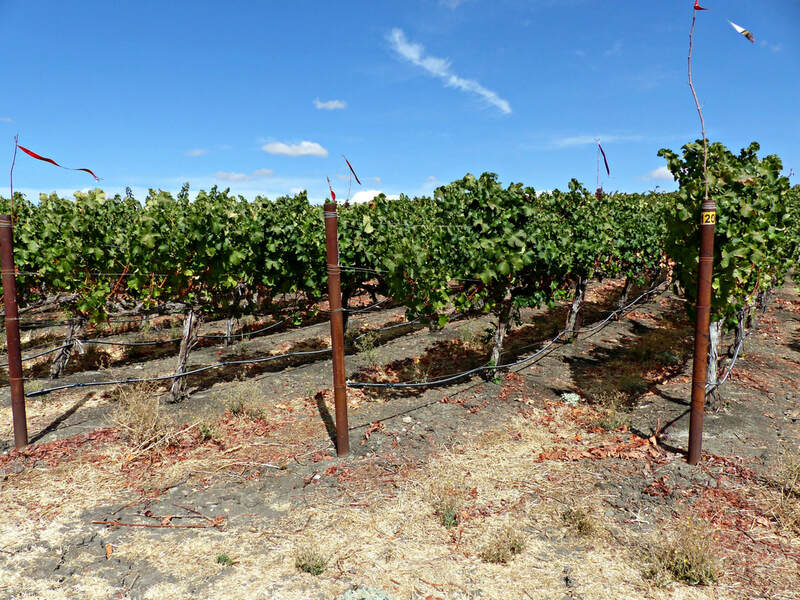 Nottingham Cellars focuses on Bordeaux varietals, producing small lots of Cabernet Franc, Malbec, Merlot, Petit Verdot, and three single vineyard Cabernet Sauvignon wines. Their flagship wine, Supremacy, is crafted as a world class Bordeaux-style wine, comprised of all five classic varietals, Cabernet Sauvignon, Merlot, Cabernet Franc, Malbec and Petit Verdot. But the Cranors have expanded their offerings, expressing the differences in terroir with the Appellation Series, Micro-Lot Reserve, Vineyard Designate, and a handful of white wines, Chardonnay and Sauvignon Blanc, and a lovely Rosé of Merlot. 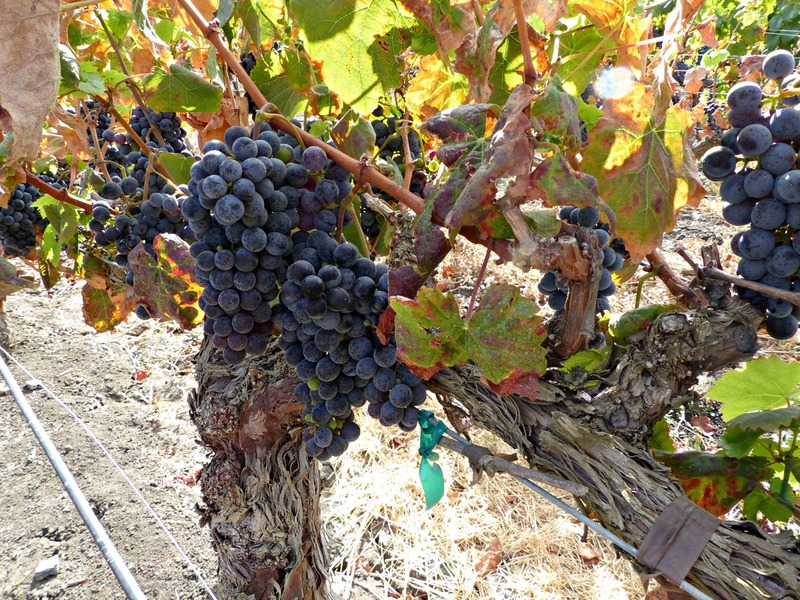 The Vasco Urbano collection shines the spotlight on Rhône varietals, specifically Grenache, Syrah, and Mourvedre, that do so well in Livermore Valley. Nine reds, four whites, and one rosé populate an ever increasing number of bottlings. “The Sherriff" is a GSM blend, and “The Colonel” reverses the blend by being a MGS, but single varietal bottlings also flesh out the lineup, in addition to Petite Sirah, Grenache Blanc, a Coco Blanc blend (Marsanne, Roussanne, and Muscat), and a Viognier dessert wine. The 1846 by Nottingham Cellars collection, a nod to the year that commercial wine grapes were first planted in Livermore Valley, includes a Sauvignon Blanc, Chardonnay, Rosé, Petite Sirah, Cabernet Sauvignon, and a red blend. 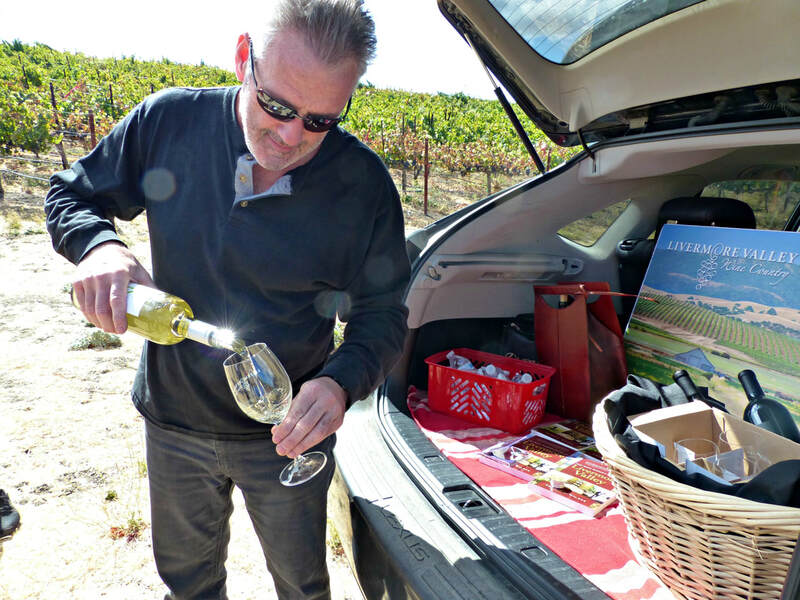 Garnering critical acclaim and awards from the beginning, Nottingham Cellars is reaching their own critical mass, admired for their passionate display of Livermore Valley’s realized potential and the possibilities that are still unexplored. Their tasting room is open Thursday - Sunday, and wines are available online, through the Wine Club, and at many restaurants and wine shops. Darcie Kent has art and winemaking in her blood, what you might call “art of the vine”. Descended from a Swiss winemaking family, her great-grandfather, Christian Ruegsegger, established his own winemaking operation, Alpine Winery, in St. Joseph, Missouri, in 1883, and indulged his artistic side by hand painting his own wine labels. Today, Darcie follows the dream, as a fifth generation vintner and artist, making small lot, single vineyard wines with her husband, David, and their winemaker, Julian Halasz, labeled with her original art. 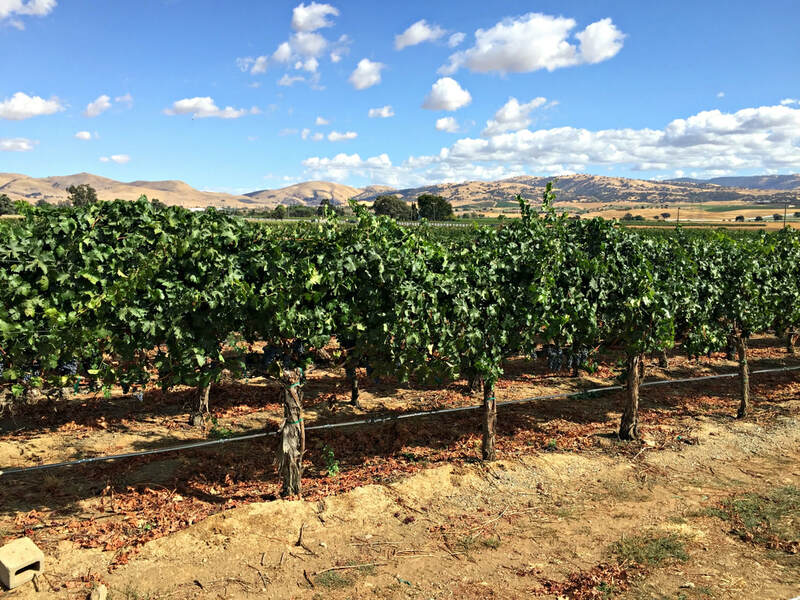 Founded over twenty years ago, Darcie Kent Vineyards is upping their game, in recent years purchasing more vineyard land and building a state-of-the-art winemaking facility in the heart of Livermore Valley. What started as a single Merlot wine blossomed into a portfolio of 22 wines, carefully composed from special vineyards in Monterey and Livermore Valley where they purchase fruit. These bright and bold bottles paint a complex palette, expressing the vineyard’s character and Darcie’s vision of food-friendly wines, “I believe that wine should accompany food, not overwhelm it, I believe deeply in lower alcohol, higher acidity, more aromatics, and that’s what we work for.” From Livermore, Chardonnay, Sauvignon Blanc, Petite Sirah, Zinfandel, and the Bordeaux varietals of Cabernet Sauvignon, Malbec, Cabernet Franc, and Merlot portray the gravel soils, warm days, cool nights, and coastal breezes. From Monterey, Gruner Veltliner, Sauvignon Blanc, and Pinot Noir sketch the cool climate hillside vineyards. The renovated tasting room, known as the Wine Gallery, has splashes of Darcie’s favorite color purple everywhere, and the walls are adorned with her stunning artwork, which are available for purchase if you should fall in love. Tables with a panoramic view of the vineyards and hills really brings home the concept of terroir, as if you’re drinking the fruit on the other side of the windows. Over by the bar, their collection of award-winning wines are proudly displayed. Outside, a historic red barn, over a century old, adds to the charm and production capacity. On the lawns, a live concert series happens in summer. The 2016 Victories Rosé of Malbec is enchanting, with vibrant watermelon and cranberry fruit, a whiff of rose, and a mineral backbone, it’s more savory than fruity. 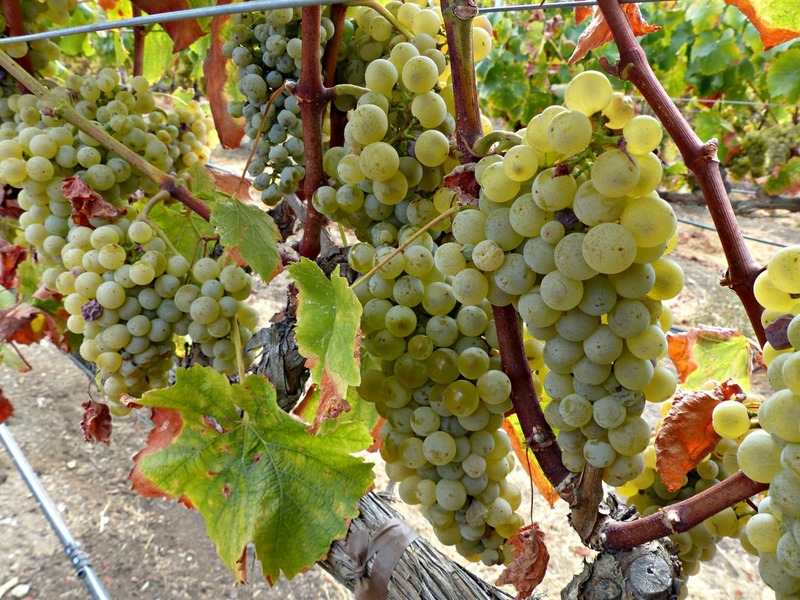 And the Rava Blackjack Gruner Veltliner is refreshing, so aromatic with stonefruit and pineapple, mineral with good acidity, white pepper spice, and a slight grip from time spent on the skins. Darcie is enamored with Cabernet Franc, and her 2012 Stonepatch Cabernet Franc really delivered. In 2016, it was voted the #1 wine in Livermore Valley, light and bright, yet with a richness of dark fruit flavor, well balanced in its acidity and structure. 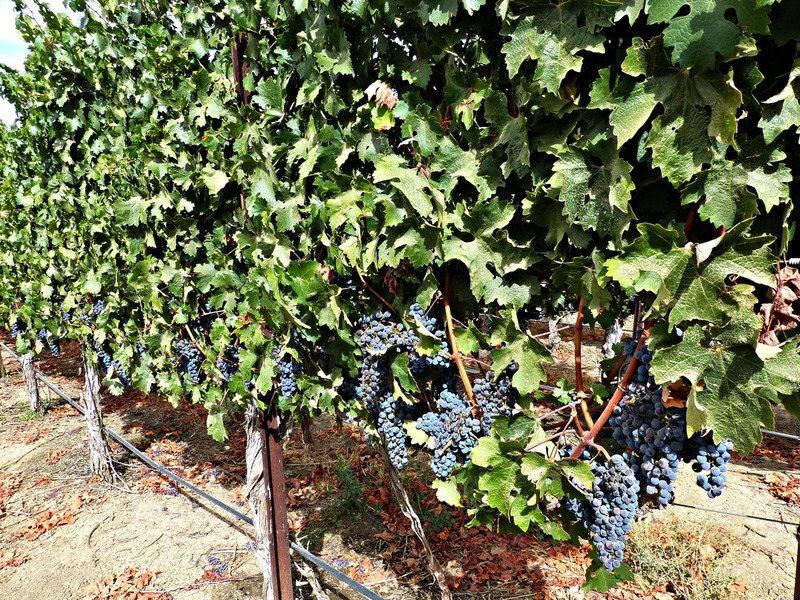 The Madden Big Petite, Madden Cab, and Field Blend Zinfandel are also noteworthy, on the bigger side of the wine spectrum. 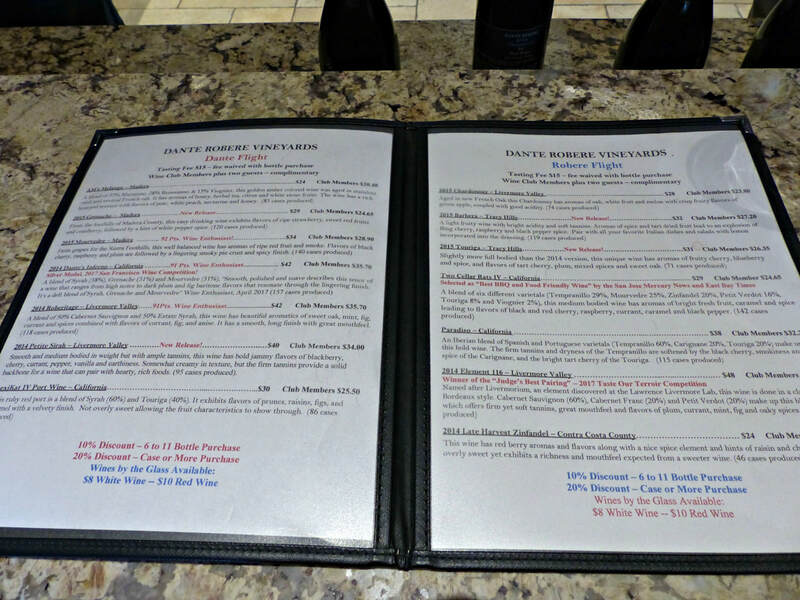 Darcie Kent wines are sold direct to consumer, through the wine club and tasting room, open Thursday - Monday, and are on some restaurant wine lists as well. 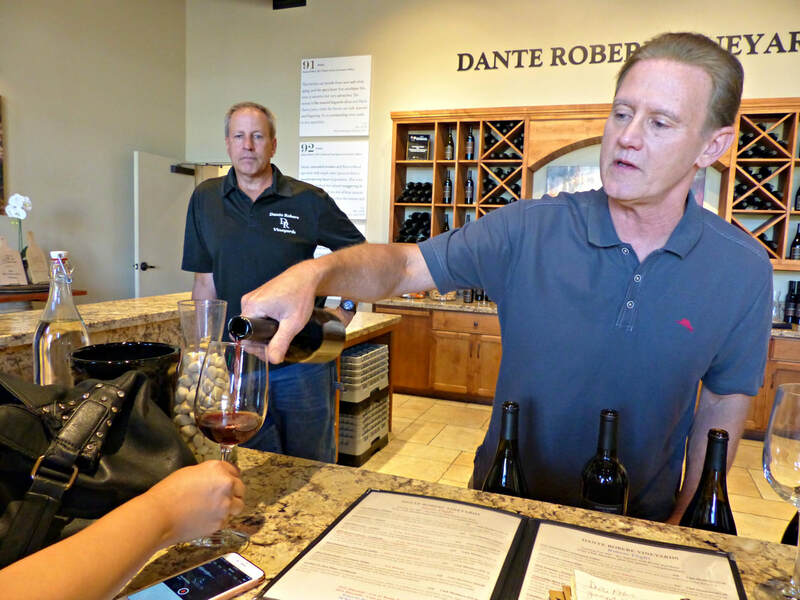 Dante Robere is an amalgam of winemaker owners’ Dan Rosenberg and Bob Bossi names. Friends for over 30 years, Bob was always into wine, but when Dan moved to Livermore in 2003, a grand plan was hatched. 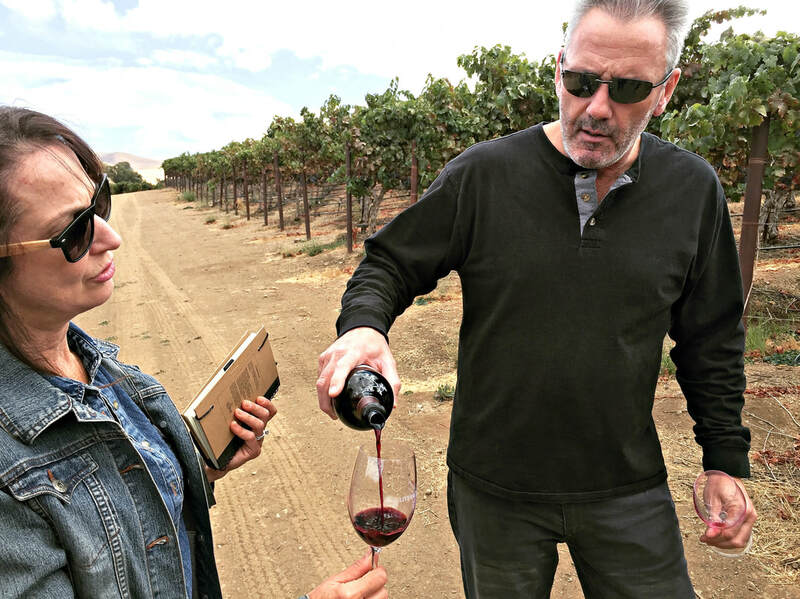 Starting as home wine makers with backyard Zinfandel, the pair went all in, learning how to make wine from neighboring Livermore Valley winemakers. In 2012, they took the plunge, purchasing a 6 acre Syrah vineyard and building a winery and tasting room on the property, which opened in 2015. 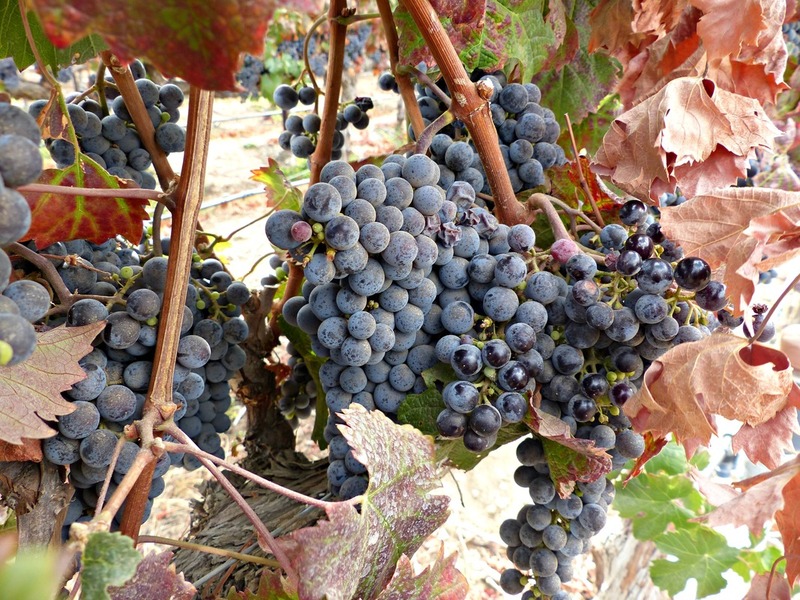 They are the youngest winery in the Valley, and mostly purchase fruit, experimenting with different varietals, such as Tempranillo, Touriga, and Barbera. 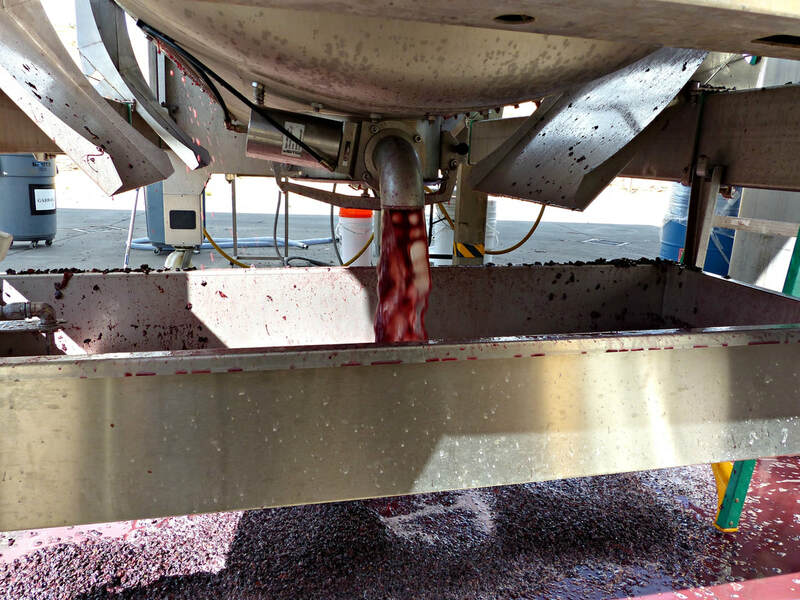 Bossi and Rosenberg were encouraged how well their first commercial batch of wine turned out in 2011, but realized the learning curve is steep, since every year’s harvest is different. Working hard to build a business that they can pass on to their children, they produce small lots of 14 wines, from Chardonnay and Viognier, to award-winning red wines of Mourvedre, Syrah, Barbera, Petite Sirah, Touriga, Tempranillo, and Zinfandel. In addition, several red blends are made along with two dessert wines, a Port and a Late Harvest Zinfandel, which round out their intriguing lineup. I particularly liked the smooth and polished 2014 Dante’s Inferno, a Syrah/Grenache/Mourvedre blend with its plum fruit, fig notes, and long finish, and the Touriga, a full-bodied wine with ripe cherry and blueberry fruit, with an edge of spice and tart fruit, accented with a touch of oak. The wines are available through the wine club and tasting room, which is open Friday, Saturday and Sunday. 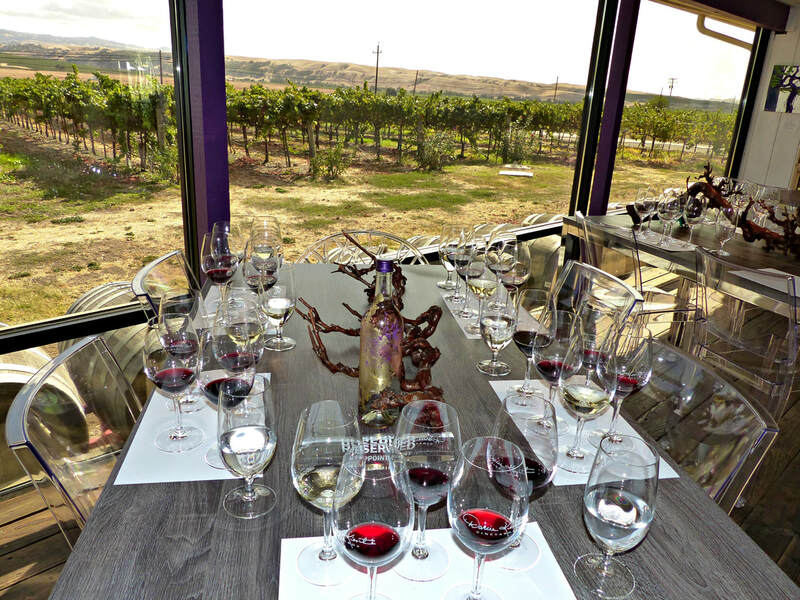 Livermore Valley’s wine country is kicking it up a notch, with so many exciting and new approaches to what has been the norm, in addition to rediscovering California’s iconic Cabernet Sauvignon and Chardonnay wines that first took hold here. Transformed into a wine destination, it’s easy to visit, and with so many activities available outside of the wine-centric, it’s fun for everyone. There are several wine events throughout the year, in fact, Barrel Tasting Weekend takes place March 10-11, 2018; it’s an opportunity to assess a new crop of wines still in barrel alongside winemakers at more than 30 wineries, and a couple of distilleries and breweries. 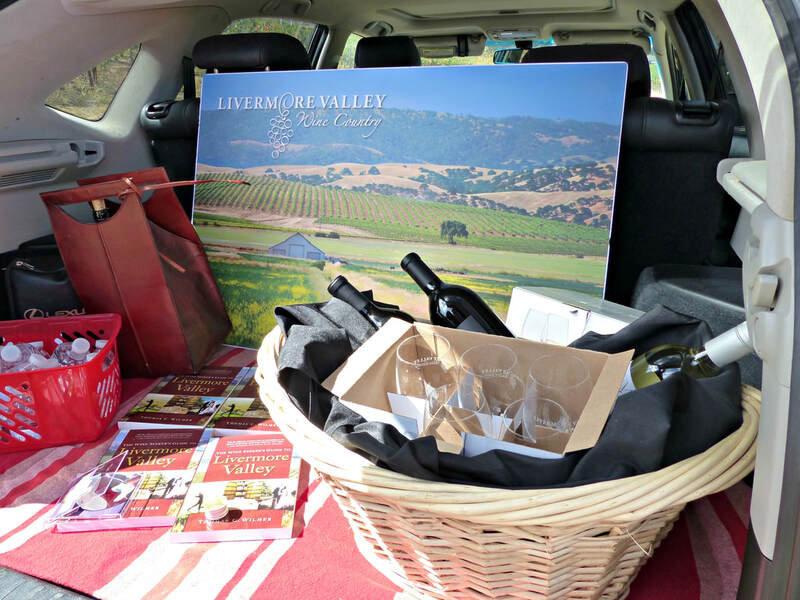 Put Livermore Valley and the Tri-Valley area on your map, and get here before the crowd does, it’s accessible, affordable, and approachable, all at a friendly pace that makes for a great escape, with an added bonus, wines for your home wine cellar!